At our lunch and learn last month, Investment Executive Matthew Flynn of Fifth Third Securities shared the latest information on health care and tax law changes, and their impact on small businesses. Below you will find Matt’s summary of the tax laws and changes to the Affordable Care Act, also known as Obamacare, since 2009 and what is expected through 2018. Click here for the latest update on these provisions from the IRS. Prohibition of lifetime dollar limits on essential benefits. Children are covered up to age 26 on their parent’s policy. Pre-existing condition exclusions are prohibited for covered individuals younger than 19. Internet portal “Health Care Exchange” to facilitate consumer and small-employer shopping is established. Tanning Tax: 10% tax on individuals using indoor tanning salons. FSAs/HSAs/HRAs: Over-the-counter drugs are not allowed as an expense without a prescription. 10 to 20 percent, disadvantaging them relative to IRAs and other tax-advantaged accounts, which remain at 10 percent. Prescription Drug Fee: Annual fee on Manufacturers and importers of branded drugs based on each individuals company’s share of the total market. Between 2011 and 2019 this will amount to a $27 Billion tax increase. Employer Reporting of Insurance on W-2 (Min$/Jan 2012): Preamble to taxing health benefits on individual tax returns. Business Regulation Costs: Obama Care raises corporate taxes through stricter enforcement, because businesses will be required to report more information on their business activities. This will raise taxes and additional $17 Billion from 2012 through 2019. Top marginal Tax Rate: Increase from 35% to 39.6% for taxable incomes over $400,000 ($450,000 for married filers). Dividends & Capital Gains Tax Rates: increase from 15% to 20% for taxable incomes over $400,000 ($450,000 for married filers). Medicare Tax: 0.9% increase for taxable incomes over $200,000 ($250,000 for married filers). Unearned Income Tax: Additional 3.8% tax on unearned income such as interest, dividends and capital gains (including real estate sales) for taxable incomes over $200,000 ($250,000 for married filers). Medical Device Tax: 2.3% excise tax on Medical devices costing more than $100 charged to Medical Device makers which will be passed on to consumers. Estate Tax: Increase in the rate from 35% to 40% on estates over $5,000,000. FSA Cap: Flexible Spending Account contributions will be capped at $2,500. Personal Exemptions: Adjusted Gross Incomes over $250,000 ($300,000 for married filers) will have their personal exemption limited. Itemized Deductions: Adjusted Gross Incomes over $250,000 ($300,000 for married filers) will have their Itemized Deductions phased out. Medical Expense Deductions: The itemized-deduction hurdle for medical expenses is going up to 10% of adjusted gross income from 7.5% of adjusted gross income. Individual Mandate: Anyone not buying “qualifying” health insurance will have to pay an additional tax starting at 1% and growing 2.5% of Adjusted Gross Income by 2016. 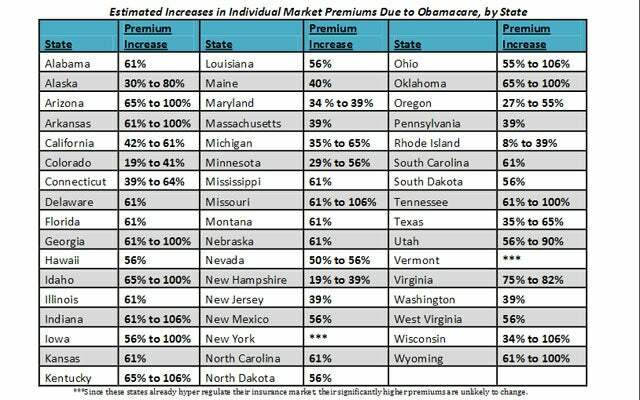 Click here for an infographic on the estimated increases in individual market premiums by State. Michigan is projected to have a 35-65% increase in health care premiums for individuals. Employer Mandate: Businesses with 50 or more Full Time Employees (FTEs) must offer all employees working an average of 30 hours per week or more in a month health care coverage with “minimum value,” beginning in 2014, or pay penalties. Click here for an infographic on penalties for employers not offering affordable coverage under the Affordable Care Act. 1. Large employers that do not offer coverage to their full-time employees face a penalty of $2,000 times the total number of full-time employees if at least one employee receives a tax credit to purchase coverage through a state-based health insurance exchange established under the PPACA. 2. If large employers do offer coverage to their full-time employees and their dependents but the coverage is “unaffordable” to certain employees or does not provide minimum value, the employers face a penalty of $3,000 times the number of full-time employees receiving tax credits for exchange coverage (not to exceed $2,000 times the total number of full-time employees). 3. A full-time employee is an individual employed on average at least 30 hours per week, half-time would be 15 hours per week, and 100 half-time employees would equal 50 full-time employees. 4. If an employee’s share of the premium for employer-provided coverage would cost the employee more than 9.5 percent of that employee’s annual household income, the coverage is not considered affordable for that employee. If an employer offers multiple health care coverage options, the affordability test applies to the lowest-cost option available to the employee that also meets the minimum value requirement. 5. The plan must cover a “minimum value” which is 60% of the costs of covered services (considering deductibles, co-pays and co-insurance) for the employees and their dependents (children age 26 or under). 6. Health Insurance Premium Sales Tax: A new sales tax on Health Insurance that will increase premiums by 2.3% in 2014 growing to 3.7% in 2023. The tax is a flat fee on Insurance companies based upon the number on insured’s covered by the Insurance Company. The amount of the tax will be $8 billion in 2014, increasing to $14.3 billion in 2018, and increased based on premium trend thereafter. 7. Health Insurance Premium fee: Additional $63/insured paid by the Insurance companies. It is a temporary assessment levied for three years starting in 2014, designed to raise $25 billion. It starts at $63 and then declines. 8. Health Insurance Exchange: Originally designed to begin October 1, 2013 the Federal Health Insurance Exchange will most likely be delayed until January 1, 2014 or later. The exchanges “Bronze plans” and “Sliver plans” are capped at 9.5% of your income for 300 – 400% FLP ($89,500). It’s a sliding scale so those under will pay less. “Gold plans” and “Platinum plans” can cost no more than 12% of income. Although high end plans may be subject to a 40% excise tax depending on cost. Depending on your income you may pay only a percentage of the total cost. You may qualify for discounts to help pay for premiums if your income is from $15,302 to $46,021 for an individual and $31,155 to $93,700 for a family of four. The IRS estimates that the Bronze Plan will cost $20,000 per year by 2016, before subsidies and tax credits. The Health and Human Services Department estimates that health costs will surge 7.8 percent in 2014, when Obama care is due to be fully implemented, and 6.2 percent a year on average for the decade thereafter. 10. Medicaid expansion: The health care law also expands the federal-state safety-net program to cover more low-income people. Medicaid is expected to account for close to half of the 30 million uninsured people who, the Congressional Budget Office estimates, eventually will gain coverage through the law. The federal government will pay the full cost of the new coverage from 2014-2016, then phase down to 90 percent. States are free to reject the expansion. In those states, many adults below the poverty level would remain uninsured. Click here for an infographic about the Medicaid Expansion in Michigan. Click here for an overview of how the Affordable Care Act impacts Medicaid. Doctor’s income is based on quality of care not quantity of care. This is a vast simplification of the actual documentation in the bill. It is a protection from the current fee-for-service payment model. Cadillac Tax: A 40 percent excise tax will be imposed on the value of health insurance benefits exceeding a certain threshold. The thresholds are $10,200 for individual coverage and $27,500 for family coverage (indexed to inflation). The thresholds increase for individuals in high-risk professions and for employers that have a disproportionately. Elective Deferral Limit for Defined Contribution Plans $17,500. Make sure your company is set up in the most advantageous way possible for your tax situation. Matthew Flynn has been in the financial services industry since 1992. He is currently an Investment Executive for Fifth Third Securities, a division of Fifth Third Bank. Matt’s clients are small business owners and he helps them maximize cash flow, save for retirement, and minimize taxes. Matt earned a Bachelor of Arts in Accounting and Finance. He serves on the board of the CareForward Foundation, an organization which provides resources to brain injured patients, their families, and caregivers.